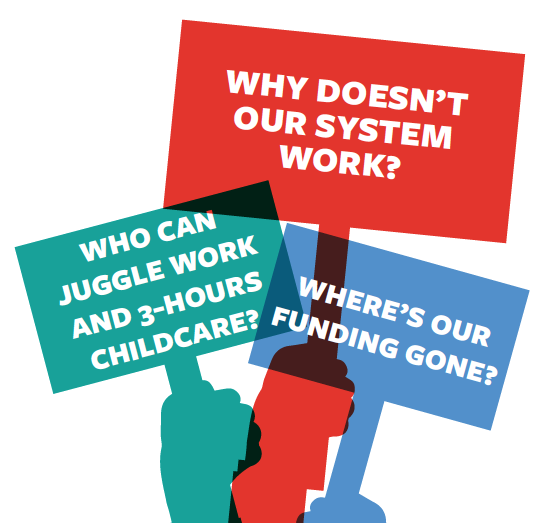 Campaign group Fair Funding For Our Kids have again raised concern about the suitability of the Scottish childcare system and how it is serving working parents across the country. In an exclusive interview with Children in Scotland Magazine, a spokesperson from the group highlighted inflexibility and inaccessibility in the current system as amongst the issues facing parents today. “The first challenge for parents is figuring out the childcare system, which varies across the country, and then square a three-hour, ten-minute, term-time only place with any kind of job,” they said. Through its own research, the group found childcare to be a barrier for a number of parents wishing to change their jobs. They also raise concerns about the lack of national agreement for parents seeking childcare outside their resident local authority. Their criticism comes as the Scottish Government continues with its plan to double the number of funded childcare hours by 2020. Children in Scotland Chief Executive Jackie Brock welcomed the campaign’s work in shining a light on inadequacies in the system, whilst supporting the government’s ambition. She said: “We recently completed a short-term secondment with the Scottish Government as part of a team working with 14 local authorities on trials to test how best to expand early learning and childcare to 1140 hours. This evidenced significant benefits but also how much work needs to be done.